Mesotherapy - which is sometimes called rehabilitation therapy, can make individuals look younger as well as stimulating your body and its immune system. This well known and accepted therapeutic process, invented in 1952 by Dr. Michel Pistor (France), is an alternative medicinal therapy that requires quire rigorous procedures and is applied in the safest conditions. It can only be practiced by a qualified and experienced medically trained professional, with additional training in Mesotherapy. This therapeutic process is now practiced in many countries of the world. Mesotherapy is a treatment that stimulates the mesoderm, or middle layer of the skin. It is done with homeopathic agents containing placenta, nucleoproteins, oligo-elements and vitamins. Medication is administered subcutaneously with special disposable micro needles. Micro-drops of the drug are slowly absorbed into the blood flow; the results usually become visible after the first treatment. Other treatments include a lifting mask and colour therapy which help to smooth out wrinkles and reduce a double chin. Mesotherapy is an easy set of injectable medications, vitamins, and minerals. Depending on the desired effects that you want, the area being targeted, and the problems that you hope to resolve, a number of ingredients are combined to produce the various "cocktails" that will be injected for your treatment. For example, the mixture of ingredients used to break down fat deposits on your hips is different from that used to break down fat deposits under your eyes. Still another formula is used to address the fat under your chin. Cellulite and facial rejuvenation treatments require another set of ingredients altogether to obtain your desired results. The medications that make up the Mesotherapy cocktails work to break down the fat located underneath your skin. The medications force the membrane of the fat cell to collapse and what is left travels through the bloodstream and is removed from your body through the kidneys and bowel. Side effects of the procedure may be a possible reddening, swelling and/or bruising around the area of the injections. These symptoms generally disappear in a matter of hours. Mesotherapy is generally suitable for most people, including children and those with diabetes. There are no age restrictions. General restrictions vary with conditions treated and will be discussed before treatments are administered. You can not wear makeup for four hours after Mesotherapy. You can not vigorously exercise for 48 hours. No hot showers are allowed for 6 to 8 hours after treatments. It is also recommended to eat a meal high in protein prior to treatment. The Mesolift process delivers vitamins, minerals and amino acids directly into the skin to nourish and rejuvenate, promote production of collagen and elastin, and stimulate your metabolism. As your skin ages, circulation decreases, and the resulting reduction of oxygen and nutrients hinders your body's ability to flush out toxins. This is what drives premature aging and causes the skin to develop an ashen appearance. Mesotherapy can be used a supplement, or an alternative, to many anti-aging regimens, including botox, laser resurfacing, peels, antioxidants, topical creams and facelifts. 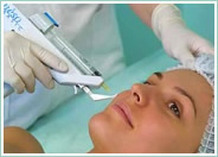 Mesotherapy is also a highly effective rejuvenating treatment. The procedure can be used to tone and tighten sagging skin on the neck, legs, abdomen, arms and hands. In Europe, women often start treatments in their thirties, but Mesotherapy can prove valuable during any stage of a woman's life.